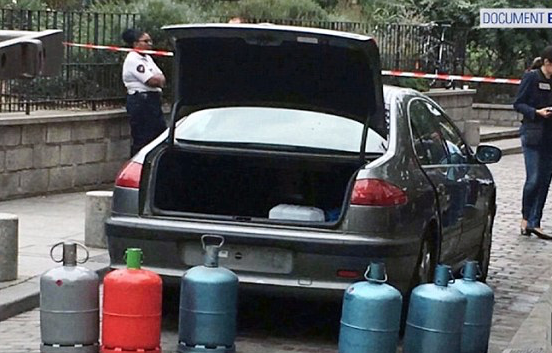 A car filled with gas cylinders was today found parked outside a synagogue in the south of France. The suspicious vehicle was discovered by police officers after it was left near the Bar Yohaye synagogue in Marseille. Dozens of worshippers were inside the building and were attending a service on Saturday morning. The discovery comes just one week after a similar vehicle – also filled with gas cylinders – was left outside the famous Notre Dame Cathedral in Paris. A jihadi woman, 29, who is on a terror watch list, masterminded the plan and disappeared with her boyfriend, aged 34, last Sunday morning. Her Peugeot 607 was found with its lights flashing in a no-parking zone in Paris’s Rue du Petit-Point, across the River Seine from Notre Dame, at 7.30am. There were seven gas canisters inside – prompting fears of a terrorist attack on the ancient place of worship, which is high on a list of ISIS targets. Three women were arrested and it was reported that they were allegedly planning to blow up the busy Gare du Lyon train station in Paris.